CARDIFF CITY | Marshall (c), Peltier, Manga, Whittingham (Da Silva 86), Ralls, Mason (Dikcagoi 75), Noone, Pilkington (Revell 90+4), Connolly, O'Keefe, Malone. SUBS | Da Silva, Macheda, Dikcagoi, Revell, Moore, Kennedy, Ameobi. WOLVES | Ikeme; Iorfa, Batth (c), Ebanks-Landell, Doherty; McDonald, Coady (Henry 45), van La Parra, Edwards, Graham (Enobakhare 65); Zyro. SUBS | Martinez, Golbourne, Saville, Price, Byrne, Henry, Enobakhare. How to make your coach look silly - put in a home performance like this after he begins to delude himself about getting in the playoffs. Thanx for the comms folks, shame about the football. Disappointment with the result, and with Graham's injury. Let's hope he's back before too long. Thanks for your company today everyone. Cheers, Carly & Otto and all our Wolves Bloggers, what a good blog it is all the best to everyone for another week. Full time: 1-3. 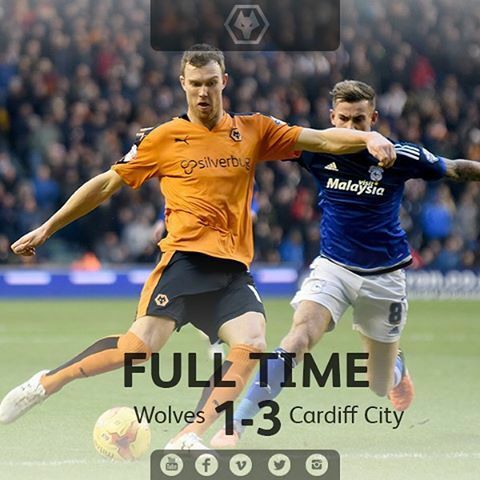 Wolves' good run comes to an abrupt end. We had plenty of the game, but Cardiff were absolutely ruthless from range. Was hoping that Wolves would show real intent today. Optimistic of me. Looks like intent is mid-table. Karlo, they are club employees, we were relegated to the 3rd division and the players were all performing well according the blog, it was just bad luck.